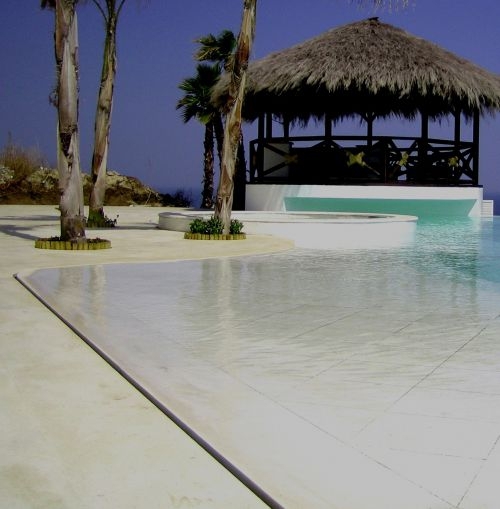 For a lot of people, overflow swimming pools seem to be very mysterious and unnecessarily expensive. Indeed, throughout my career I have seen people being opposed to the construction of overflow swimming pools for a number of reasons, some of the most notable ones reprimanding their excessive water consumption or prohibitive costs. I think it is time to take a step back in order to separate truisms from popular fallacies. With the help of the diagrams below, we’re going to look at the overflow concept without getting bogged down by overly technical details. In simple terms, there is absolutely no difference between a skimmer pool and an overflow pool in regards to the loss of water. 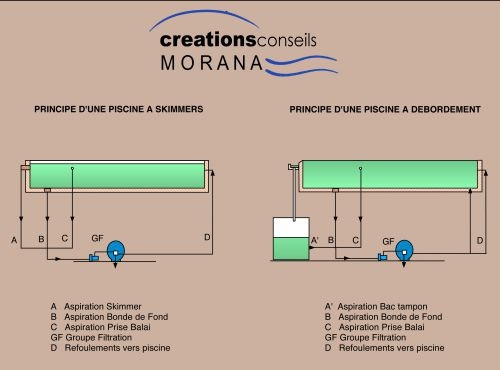 In a skimmer pool, the water from the pool is sucked into the filtration system by the skimmer so that it may be filtered and then returned to the pool: In other words, it is closed circuit. Here, the only loss of water happens naturally through evaporation, which is most common during the summer. 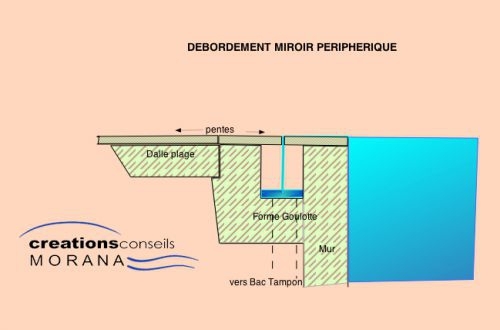 With an overflow pool, instead of having the water sucked in by the skimmer, it is collected in a “water tank”. The water is then filtered and redistributed to the pool through a mixture of different return inlets ( floor & multi-flow). 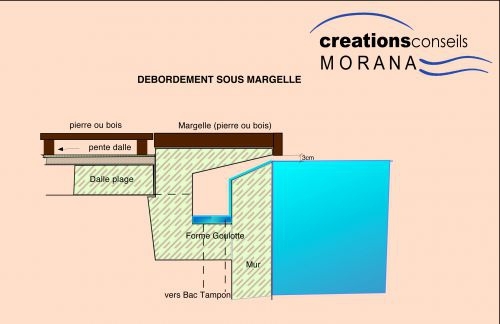 Since the pool is already full, the incoming water automatically spills over into the water tank, creating the overflow effect. Although the circuit is “technically” not closed, it is always the same water that flows in and out of the filtration system. So, no need to worry about issues of water consumption. A quick side note: A positive outcome of this particular filtration system is that overflow swimming pools tend to be much cleaner then their counterparts since the entirety of the water is perfectly recycled on a regular basis. The grime usually found at the bottom of the pool is, in this case, forced upward by the floor return inlets. Because of this, the treatment of the water is much easier to manage and a lot less costly ( treatment products, etc…). This is why you shouldn’t be surprised that more and more public swimming pools are now turning towards the overflow concept. 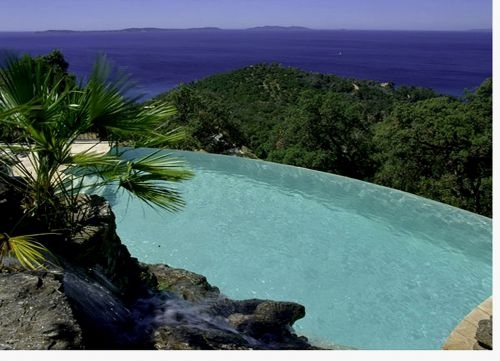 One last point which might be of interest to you: Many wonder about the costs of such pools. As illustrated by the diagram, they require a few additional elements: 1) A gutter to re-direct the water to the 2) water tank, 3) a check valve, 4) a buffet tank control to avoid the loss of water and 5) a system of water adjustment by solenoid valves ( to protect the pump). That’s all! Whilst it certainly may be an additional cost, it isn’t as significant as some might expect. When preparing a swimming pool project, it is highly advisable to ask for an estimate of an overflow swimming pool: not only is it highly beneficial in terms of the quality of the water, but it is also an undeniable aesthetic bonus! It's probably one of the oldest type of overflow out there, and it still exists in countries like Morocco or Tunisia: the Under Coping Overflow. Originally, the system ensured the adequate skimming of the water by injecting fresh (water) into the pool, which forced the surface water ( which is dirtiest) through the overflow channel and into the sewers. The fact that none of it was ever re-used meant a huge daily consumption of water that would, of course, be unacceptable by our current standards. Today, the use of water tanks ensures that this type of overflow can still be used. However, much like the older version, the use of an under coping overflow certifies both an optimal recycling of the water (much more effective than skimmer pools) and a much lower rate of evaporation compared to other types of overflows. Only downside: its aesthetic appeal is limited, if not practically inexistent. This is why it is most often recommended in projects where the client has no particular desire for any other type of overflow, or in cases where an overflow channel already exists. Referred to in such a way because of the precise alignment of the water with the level of the deck, this perimeter overflow is generally used to create a calm, relaxing atmosphere. 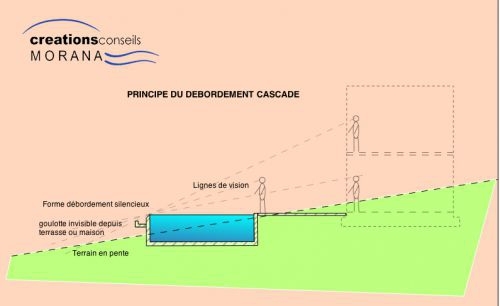 Also, it allows people to visualise the entire water surface, regardless of where they stand. To many people, this creates the illusion of having a mirror laid out on top of the garden. It tends to be perfectly silent, if the overflow channel is well-made, and is built using one of two methods: Swimming pool builders either use a steel grating to allow the water to escape to the storage tank, through the overflow channel, or they replace the grating with a small gap in the floor of the pool. Both the grating and the gap are always located at the junction between the deck and the pool. 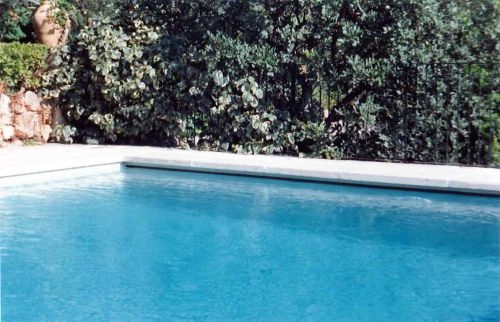 For example, in the swimming pool shown below, the latter method was used. But, regardless of the method you choose to use, it is important that you do not forget about the two symmetrical slopes situated near the edge of the pool. They ensure that rain water, or wastage left behind after cleaning the deck, doesn't get mixed in with the water from the pool. Inversely, they also guarantee that most of the pool water doesn't leak out onto the deck. Below, you may find the two types of deck level swimming pools available to you: one using the grating system (left) and one using the more elegant and discrete "floor gap" system (right). It is best used in projects that already possess an existing patio or a flat, even area. More importantly, it has the added benefit of being compatible with any swimming pool shape, be it geometric or free form.